Crumbles. Well, everyone’s made them at some stage of their baking pursuits. My favourite has usually been cinnamon apple, most certainly with an oat based topping, and definitely served alongside vanilla ice-cream. Nothing much has changed over the years, although I’m growing to really love apple and strawberry as a combination (but still have a strange aversion to the very popular flavour duo of strawberry and banana, as seen in many yoghurts and smoothies). Since the climate here in Australia is so varied, we currently have local apples in season, as well as strawberries from further north, where the warm Winter weather is perfect for growing them. My tip for making crumbles is : Don’t peel the apples. There is plenty of flavour (and dare I say it, .. nutrients) in the skins and it softens as it cooks to the point where you don’t notice the skins are present in the final dish. My other tip is, make more than you think you need, because it reheats beautifully and I’m pretty sure “too much crumble” has never been a documented malady. Ever. Wash the fruit. Core the apples and chop them to a rough 2cm dice. Gently cook the chopped apples in the juice of half a lemon, a few tablespoons of caster sugar and a splash of water. 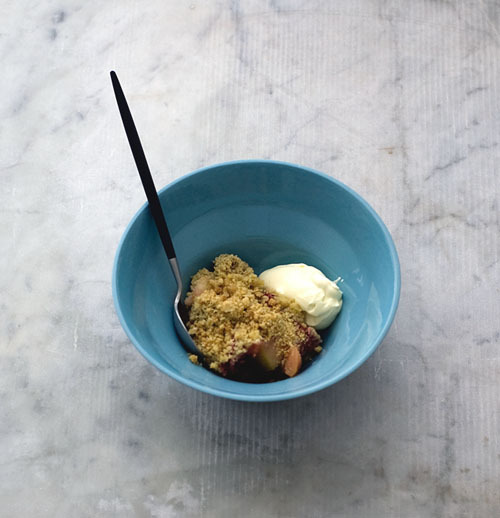 When the apples are tender, toss in the hulled berries and a teaspoon of vanilla extract. Transfer the fruit into a baking dish, cover generously with crumble and bake in a 175’C preheated oven for 25-30 minutes until the fruit is bubbling away at the edges, and the crumbled topping is golden. Combine all the ingredients together, rubbing the butter in until it resembles bread crumbs. Set aside until required. Those couple of hours after you’ve had the regulation two pieces of toast or that austere bowl of bran flakes. The moment when someone in the room finally says, Right, I’ll make the tea, shall I? Then it’s off to the kitchen, pulling out the mixing bowls, trying not to get batter on your pajamas while making something suitably Sunday. Some people think it’s the wrong move, having muffins for second breakfast. I’ll agree, because usually I’m too busy eating sticky buns or some very large cookie that I’ve convinced myself is breakfast food worthy because it has oats in it. But the derision poured on muffins being false cakes in paper jackets is unwarranted if you’ve ever had a really good muffin. These are one of my favourites. They’re tender, not too sweet and capable of feeding a crowd, or a pair of pajama clad couch potatoes with enough leftover for afternoon tea. Easy pleasey. Preheat oven to 200’C. Combine flour, sugar, salt, baking powder and bicarbonate of soda in a large bowl. Combine eggs, buttermilk, vanilla and butter in a separate bowl. Add egg mixture to flour all at once. 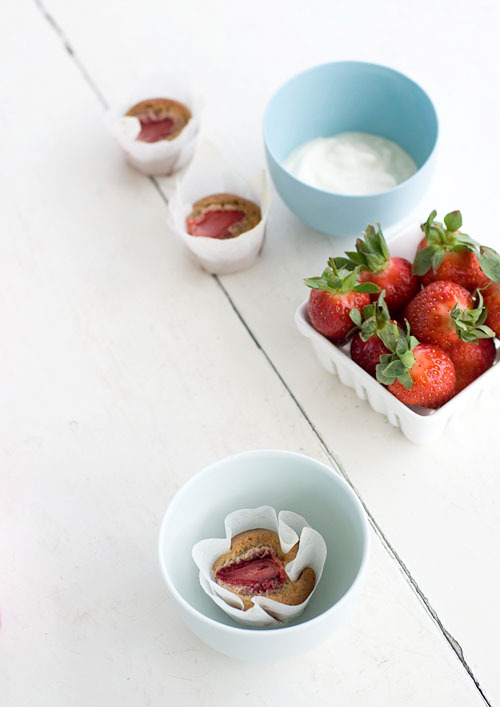 Add strawberries and fold gently, leaving a few lumps. Do not overwork mixture. 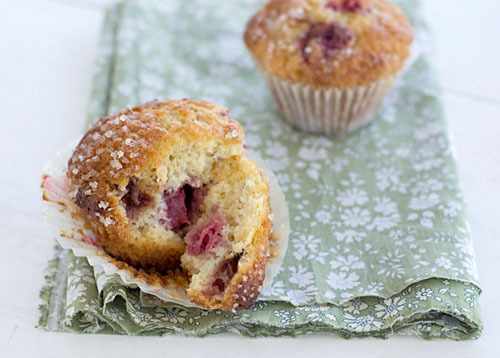 Spoon mixture into 10 muffin tins and sprinkle with sugar. Bake for 25-28 minutes or until cooked and golden. As if life isn’t confusing enough, these past couple of August days have been so warm, I have been wondering if we aren’t being set up for an early Spring. I almost wish Winter wasn’t disappearing so quickly. Not a single chestnut or perfumed quince managed to pass through my kitchen this season and the thin film of dust on my favourite braising pot remains.. undisturbed. Besides, I still haven’t made a decision on which slow cooker to get and don’t think I’m ready for the smell of sun screen lotion or the sight of people walking to their city offices in business suits and flip flops. 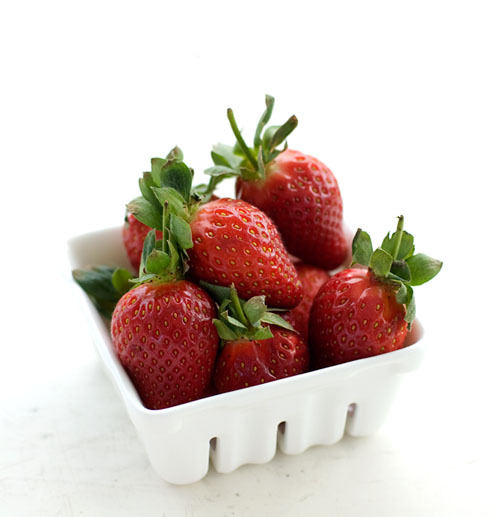 But the great advantage of living in a country with temperate weather is this is often the best time of the year to be expecting luscious strawberries. They aren’t exceptionally cheap at the moment (but then again, berries rarely are), however I did manage to buy enough recently to make a very delicious strawberry and vanilla pie. 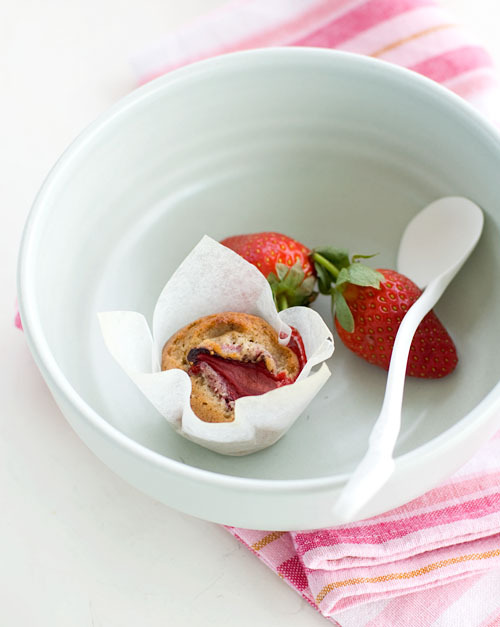 This weekend, I wanted something a little simpler, hence these little cakes which are like bite-sized nuggets of brown butter, vanilla and juicy strawberries. A plateful of these and you know what, I think I’m almost ready to give up Winter. Cook the butter in a pan on medium heat until it turns a nut-brown colour. 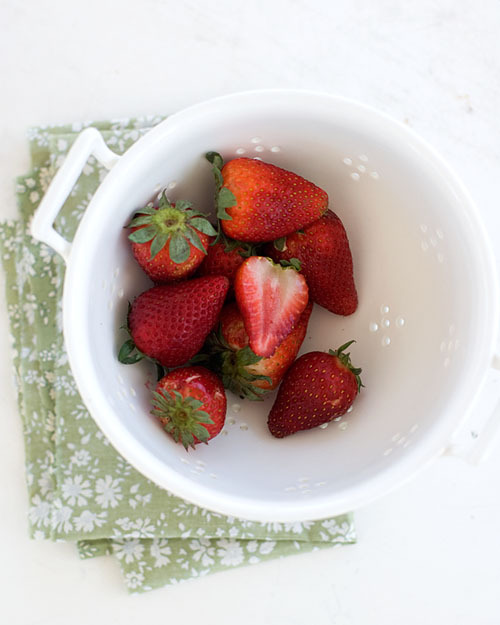 Carefully strain through a sieve into a bowl and allow to cool to room temperature. Sift the icing sugar and flours into a bowl. Lightly whisk the egg whites and vanilla essence together to combine. Whisk this into the sugar and flours, then add the cooled browned butter. Line a mini muffin tin with little squares of baking paper (or grease the tin well and dust with a light sprinkling of flour). Spoon the mixture (or pour with the help of a jug) into each muffin hole. Top with half a strawberry (or quarter the strawberries, if they are especially large). Bake in a preheated 205’C oven until a skewer inserted into a little cake comes out clean, about 15-18 minutes. Dust with extra icing sugar and eat while they’re still warm.